On the recommendation of our local wine merchant, we decided to try a dessert wine with some Roquefort. The result: a unique combination of strong, slightly salty cheese and light, aromatic wine. I didn’t think I would be a fan of sweet wine, but am always open to trying something new, especially if it’s a little out of the ordinary. I was pleasantly surprised to find that the Jurancon moelleux (Domaine de Cauhapé, Ballet d’Octobre 2007) we brought home was different than I had expected. Since I’m still learning about wine, I try to pay attention to everything when I taste a new one: the oeil (literally, the eye), the nez (the nose) and the bouche (the mouth). In not-so-literal English: the color, the smell and the taste. While I’ll let you discover the hues and bouquet on your own, I must say I appreciated the nice balance between the sweetness and acidity of this wine. At first, I noticed a tropical taste, reminding me of pineapples and mangoes. Then the intense sweetness faded away and the final seconds before swallowing were reminiscent of the dry white wine we had previously tried from the same vineyard. Like the wine merchant, I’d definitely recommend pairing this vin with a blue cheese, such as Roquefort, for the lively contrasts they create. 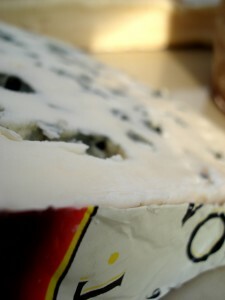 For those who are curious, Roquefort is made of raw ewe’s milk and there are several different kinds. We happen to enjoy the rich, creamy taste of Roquefort Papillon Rouge. There is a village in southern France called Roquefort-sur-Soulzon (in the Midi-Pyrénées region) and, yes, this is where they produce the cheese. I haven’t been there (yet), but would definitely be tempted to visit the caves where they ripen it. In other words, I’d like to see where Roquefort gets moldy. Apparently, Obama didn’t drink any wine at dinner last Saturday night during his visit to Paris (so I heard on the local news). I wonder if he had any Roquefort? Les fissures de la roche souterraine (fleurines), apparues suite a l’effrondement de la partie nord ouest du plateau de Combalou a Roquefort-sur-Soulzon (Aveyron), contribuent a une temperature et une humidite constantes des caves de Roquefort. Les conditions thermique et hygrometrique sont reunies pour que les pains ou “formes” au lait de brebis cru, ensemences du champignon Penicillium roqueforti, s’affinent dans des caves amenagees. Le champignon se developpe alors lentement sous le contrele attentif des maitres affineurs en donnant les celebres marbrures bleu-vert. Pour obtenir un bon roquefort trois mois d’affinage minimum sont necessaires. Des visites de fermes et de Caves (Papillon, Societe) s’imposent pour que la fabrication de ce fromage n’ait plus de secret pour vous. Quelques lieux de visite aux alentours : Millau : la cite du gant d’agneau et son viaduc la cite medievale de la Couvertoirade, le Chaos de Montpellier-le-Vieux, le cirque de Navacelles, …. C’est une belle region pour pratiquer les sports de plein air (randonnees, escalade, via ferrata,canoe, rafting, vol libre). Thanks for this great info. Looks like a visit to Roquefort-sur-Soulzon is definitely in order. t?i nhà hay t?i n?i khi?n vi?c? mang ph?i khi th?y ph? li?u quá r?ng rãi, b?n s? nh?ng ?? tru?t ph? li?u là ?? tái ch? Linh Anh là liên h? mà b?n v?i th? tin t? ?ng ?? thu s?m ph? li?u và ch?p thu?n v? giá c?.